This Item is a Pre-Order and will arrive on: Tuesday April 02nd 2019 ! FEB190478 - Batman is making his way to the end of his Knightmares, but his unseen enemy has a few more tricks up his sleeve. It's time once again to stick a knife into the Caped Crusader's broken heart, letting the groom-that-could-have-been peer in on the bachelorette (or should that be 'Catchelorette'?) party that never was. 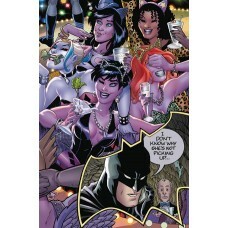 Artist Amanda Conner (Harley Quinn) rejoins the Bat-family for this month's special story-because who else you gonna invite to a shindig like this?